Chaste tree, also referred to as vitex, is a large shrub native to the Southern parts of Europe. the berries are used to promote fertility, and treat menstrual irregularities and PMS. It is one of the most well-rounded female tonic herbs available, treating a wide range of female reproductive issues. Chaste tree has a side effect of reducing libido, which has made it popular in the past by those searching for this action. Monks, and Roman soldiers are well know for using this herb for this reason, which has even lead to one of its common names "Monks Pepper". Dopaminergic effect triggers FSH, LH, and prolactin release. Chaste trees main usage medicinally was as a treatment for womans complaints. This still holds true today in western herbal medicine. [4-6, 12-13]. The eclectics used a tincture of the fresh berries as a galactagogue, and emmenagogue [4, 12-13].]. It is interesting to note that this traditional usage for promoting breast milk production somewhat contradicts the known activity of prolactin inhibition. the Spartans used chaste berry to treat impotence which also contradicts some of the other traditional uses as a means of decreasing libido. In France, this herb was used to relieve minor sleep disorders in adults and children . The chaste tree was associated as a symbol of chastity and was used as a means of suppressing sexual excitability. [4, 6]. The dried fruits have a peppery taste, and were used as a substitute for pepper in monasteries. Partly for their flavour, but also as a means of reducing the sexual excitability of the monks who lived there in order to help with the abstinence that came with the role. Chaste tree has been mentioned by Hippocrates, Dioscorides, and Theophrastus as well. .
What Is Chaste Tree Used For? Chaste tree is most commonly used for PMS, menopausal complaints, PCOS, female infertility, acne, fibrocystic breast disease, menstrual irregularities, and uterine fibroids. Chaste tree used to be part of the Verbenaceae fmaily of plants before being moved to the lamiaceae family (the mint family) after the invention of phylogenic studies of DNA sequences in the 1990's. This large family of plants contains as much as 236 genera, and between 6900 and 7200 species. Within the Vitex genus, there are 18 known species. 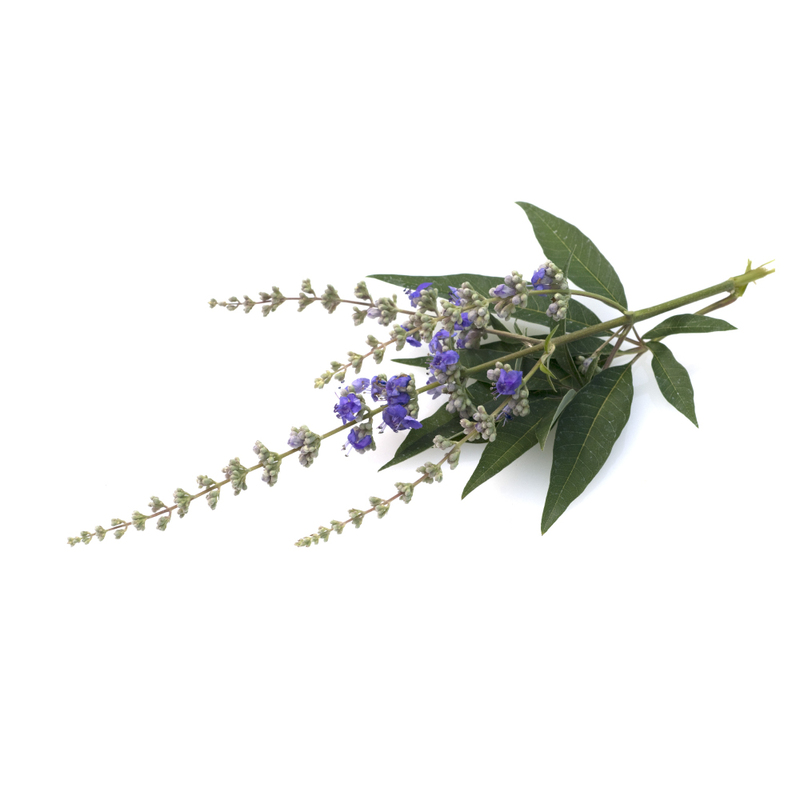 Vitex is native to southern Europe, but can be found in cultivation worldwide. It is a shrub that can be found growing between 3 and 5 meters high. The leaves are dark green and radiate from a long hairy stalk. The fruit consists of small berries that are around 5mm in diameter, and contains four seeds . Vitex agnus-castus has been shown to enhance corpus luteal development, which is the main mechanims behind decreasing estrogen dominance/progesterone insufficiency. It does this through dopaminergic activity on the anterior pituitary , and subsequent inhibition of FSH (secretion), and increase in LH (through non-inhibition) [9, 10]. This leads to a decrease in prolactin levels and a corresponding reduction in estrogen levels [11, 14]. For chronic hormone dysregulation, such as with PMS, Vitex is generally suggested as a long-term treatment (longer than 3 months) . Chaste tree berries contain an essential oil (0.7%) consisting of monoterpenes and sesquiterpenes such as sabinene, cineole, beta-caryophyllene, and trans-beta-farnesene , as well as bornyl acetate, limonene, and pinene . The berries also contain flavonoids (methoxylated flavones such as casticin, eupatorin, and penduletin), iridoid glycosides (including aucubin, and agnuside), diterpenes (including rotundifuran, vitexilactone, vitetrifolin B and C, and viteagnusins A to I), and other constituents such as vitexlactam A, triterpenic acids, phenolic acids, and cleroda-7,14-dien-13-ol. . The falvonoids offer estrogenergic effects . The essential oils pinene, bornyl acetate, and limonene are antifungal, andtimicrobial, and insect repellant. . The diterpenes are dopaminergic (in vitro) . The glycosides have an indirect activity on hormones (in vitro) . Chaste tree is useful for improving fertility in women, as well as treating a range of conditions related to the female hormonal system. This may include PCOS, PMS, uterine fibroids, menopausal complaints, acne, and fibrocystic breast disease. Chaste tree is not considered safe for use during pregnancy, but no restrictions are known during breastfeeding. . Although chaste tree is suitable for long term use, any excessive changes in the menstrual cycle should be closely monitored and application ceased or reduced. [4, 5]. Some mild gastrointestinal discomfort has been reported at the therapeutic dose . Chaste tree is often adulterated with other species of Vitex that are more widely used in Chinese and Ayurvedic medicine . Avoid taking chaste tree with progesterone drugs, contraceptive pills, or hormone-replacement therapy . Chaste tree may aggravate pure spasmodic dysmenorrheae that is not associated with PMS . Chaste tree should be used cautiously during pregnancy, and only in the early stages. It is suggested for treating insufficient corpus luteal function . Adverse effects can include: itching, rash, headaches, hair loss, fatigue, agitaion, tachycardia, nausea, increased menstrual flow (rare) and dry mouth . Hoffman D. Medical Herbalism: The Science and Practice of Herbal Medicine. Rochester, VT: Healing Arts Press; 2003:62-120. Vitex agnus-castus. Monograph. (2009). Alternative Medicine Review : A Journal Of Clinical Therapeutic, 14(1), 67-71. Jarry, H., Leonhardt, S., & Wuttke, W. (1991). Gamma-aminobutyric acid neurons in the preoptic/anterior hypothalamic area synchronize the phasic activity of the gonadotropin-releasing hormone pulse generator in ovariectomized rats. Neuroendocrinology, 53(3), 261-267. Milewicz, A., Gejdel, E., Sworen, H., Sienkiewicz, K., Jedrzejak, J., Teucher, T., & Schmitz, H. (1993). [Vitex agnus castus extract in the treatment of luteal phase defects due to latent hyperprolactinemia. Results of a randomized placebo-controlled double-blind study]. Arzneimittel-forschung, 43(7), 752-756. Boon, H., & Smith, M. (1999). The botanical pharmacy: the pharmacology of 47 common herbs. Quarry press. Weiss, R. F., & Fintelmann, V. (2000). Herbal medicine 2 nd ed. Theme Publication, 251-91. Ben-Jonathan, N., & Hnasko, R. (2001). Dopamine as a prolactin (PRL) inhibitor. Endocrine reviews, 22(6), 724-763. Weiss R. Herbal Medicine. Gothenburg, Sweden: Beaconsfield Publishers; 1988:317-318. 3.